Another hot Monday Night somewhere Northeast of Billings MT and the Monday Night Quilters gather for some good food and spirits, oh, and quilt talk! Carol can't make it, had to go to Hawaii for a couple weeks, (is this a trend?). She was in a panic before she left because she didn't have the last instructions for the mystery quilt borders before she left, must have run out of packing and needed a "finish a quilt" fix. Not sure what happened to Joyce though, no word, just couldn't make it we guess. She probably had some other commitment, more important than Monday Night Quilting, although we're not sure how that could be. But Sara made it, she was running a bit late because she had to get done with work and then go feed and water the animals before she could relax. Betty brought her hand work instead of her machine. She has a little featherweight for traveling, but struggles with changing machines on a project right in the middle of the quilt, should she get over it? Wine this, wine that, should she just cork it? LOL! Sue continues to focus on wine fabric, oh, and the wine. 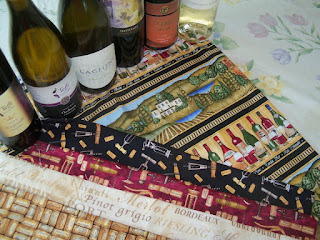 She pulls out her fabric find from her last trip to Washington State, and it looks like she's matched up additions to her wine collection with her new fabric. If she starts booking flight to Italy, her quilt buddies are really gonna be jealous! We really should tell you how this whole wine and quilt story got started for Sue. 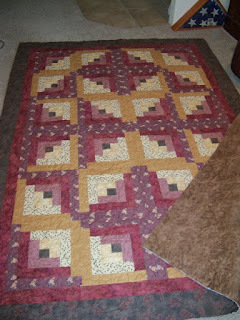 Sue went over to Betty's house for Monday Night Quilting a year or so ago and brought with her some ready cut strips she was going to sew together to make a log cabin quilt for her guest room. She laid out the fabrics on Betty's dinning room table and promptly went to the kitchen to fill her wine glass with a glorious red. With the wine glass on the table, Sue puts her sewing machine on the same table and proceeds to hook up the electrical cord and foot peddle. Unfortunately, as she's talking and prepping her work area, she forgets about the wine glass and tangles the cords around the glass. You guessed it, wine on the fabric strips!!! Shocked and sad (the wine had spilled) Betty gathers up the fabric and fills the kitchen sink with really cold water and gives the strips a plunge. Then the task of laying out the fabric on dry towels reveals an interesting color visual, the wine kinda matches some of the fabric! Not to worry, the quilt takes on the name Saint Merlot!